Now that the general election madness is behind us I have been able to concentrate more fully on local matters. This past month I have had significant interaction with three schools. The first school that I visited was Woodlands Park Primary where Saffron Toms and I were the guests with the very happy job of presenting them with a large certificate for their outstanding environmental sustainability work to the Principal Liz Manley and to her children. 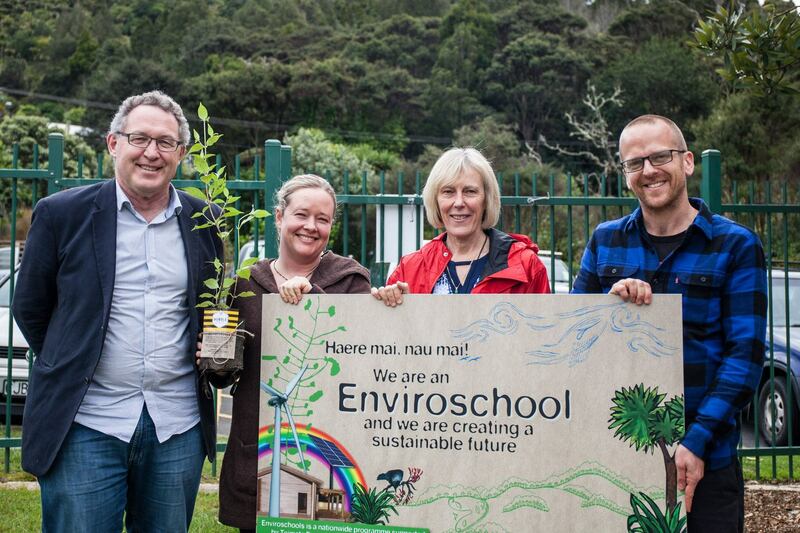 The school has a proud history of enviroschool activity led by Micah Haughton who is one of the teachers. They are very proud of their certification and do things such as actively persuade the kids’ lunches to be as wrap free as possible, grow trees and plants, and have their own composting area and worm farm. The event involved about 20 young citizens standing up and giving us a brief précis of what they were doing and how it was helping our environment and our community. They covered all sorts of areas, the relevance of Te Reo and Maori culture, the importance of worms, the need to improve water quality, how the school had actively minimized the use of plastics in the children’s lunches. The presentations were all heart felt and totally on point and relevant. At the end of their presentation I thought we should give all the young people involved the right to vote. They were all incredibly mature in their thinking and passionate in their desire to improve their school. And they have more at stake than the rest of us in ensuring that we develop into a sustainable city. The second was the Kura at Hoani Waititi Marae. I met with the Principal Haare Rua and a few others to talk with them about what assistance we can give to the school. They have the desire to improve the water quality of the stream that runs through the marae. The approach by Haare and others at the school is impressive. They are trying to create practical real world teaching examples for the children while at the same time impressing on them the importance of sustainability and environmental protection. Haare is a really inspiring Principal. He realises the importance of community and the educational benefits of teaching outside of the curriculum. If we want to prepare our kids for the future we need to make their education is broad and diverse. Teaching them narrow curriculum so they can pass a test based on limited understanding of the world we live in is retrograde for them. The Kura could grow plants, plant them on the banks of the stream, measure water quality and observe the life that a stream should produce. The Kura is also growing crops and teaching pupils about food. There is this realization that education should be for the benefit of the whanau at large rather than just the young people involved. They are also investigating the possibility of having a chicken run. I was very happy to offer them some of Titirangi’s well fed but wild fowl as there is an urgent need to reduce numbers. The third school that I visited was Konini Primary in Titirangi. Half of the school is just inside the edge of the Waitakere Ranges Heritage Area. It has a large bush area and a stream. The school grounds are very large but unfortunately the school is not funded for the upkeep of the bush area. Despite this Principal Andrew Ducat is doing what he can with limited resources. The School also has enviroschool status and the teaching of sustainability is clearly an important part of its curriculum. And the protection and enhancement of the bush area is a priority for the school. For each school the Board is able to offer small grants to help with the restoration work. We are also able through Ecomatters Trust to ensure they receive the best advice on how to tackle restoration of the bush. If contractors were used to perform similar amounts of work the cost would be significantly greater than the size of the grants. But through these grants and the power of community and the passion of the staff and the pupils really good things can be achieved. I am concerned that the Enviroschools budget is one of the budgets that has been cut through Council cost saving and the local board is being asked to fill in the gap. But the work is far too important not to be funded. The meeting was very well organised and the presentations were superb. Heather Tanguay, Michelle Clayton, Penny Hinchelwood and the other members of the associations should be praised for their work. Congratulations to the Glen Eden Residents Association and the Glen Eden Community Patrol for organising the meeting and for taking an active approach to dealing with this very important issue. Communities work better when local groups and the arms of the state, whether they be Police, Health or Local Government, work together. Auckland Transport has released the summary report following its consultation with local communities about possible public transport improvements in the Waitakere Ranges area. The response from the community was outstanding. 839 replies were received. The initial conclusions were that there were two potential routes identified, the first from Piha to Glen Eden, via Waiatarua and Oratia and the second from Huia/Parau to New Lynn via Woodlands Park and Titirangi. Both routes would terminate at the respective railway station. Although other possible routes were identified low demand precluded a set route being established at this stage. A Kowhai Connection type service could be trialled. The big caveat in the report is that funding would have to be identified and there is currently no funding for the further services. AT wants to talk to the Board about funding but I am not sure why. We do not have separate funding that could be applied to such a service and besides local residents pay rates including their transport levies and have a legitimate expectation to a public transport service. And right now there is no public transport to large parts of our local board area. There has been a welcome surge in the number of community groups dedicated to pest control in the Ranges. Recently groups have been formed in Huia, Oratia and Henderson Valley. Council staff have been happy to coordinate with these groups and practical help, in the formulation of a system that will allow these groups to benefit from Council’s bulk purchasing power is under way. There has always been an emphasis on pest eradication with the Ark in the Park being the most prominent example. Robert Woolf, chair of Forest and Bird Waitakere organised a recent meeting of the various groups to seek a joint approach to the Government to see if funding from the 2050 Pest Free fund could be acquired. An expression of interest has been lodged. Hopefully this will be successful. I recently met with a representative of the company that has purchased the Rotondo site in Titirangi. I know the site well. It is up the road from where I live and when I was the chair of the Titirangi Ratepayers and Residents we mounted a legal challenge to previous plans to the develop the site on the basis that the building was out of scale for the site. The discussion I had with the new owners was positive. They are investigating a building with a reduced size, two stories rather than three. They are very conscious of the fragile nature of the area. Their intent is to build and retain the building and the business ethos is to take a long term cooperative approach to building ownership and management. How is Super City going? Finally I was asked recently by the Herald about my thoughts on local democracy and Super City. Is it working? “I am afraid that out west local democracy has slipped a little. Before there was a strong and abiding sense of partnership between ecocity Waitakere City and the local community but now that relationship is not as strong. The Westie network still exists but councillors have too many constituents to deal with properly and local boards do not have enough power to make really meaningful change. Clearly work is required. Local representatives are working on this. But I do remember fondly the days of Eco City and wonder if we could not be doing more in line with the Eco City ethos.